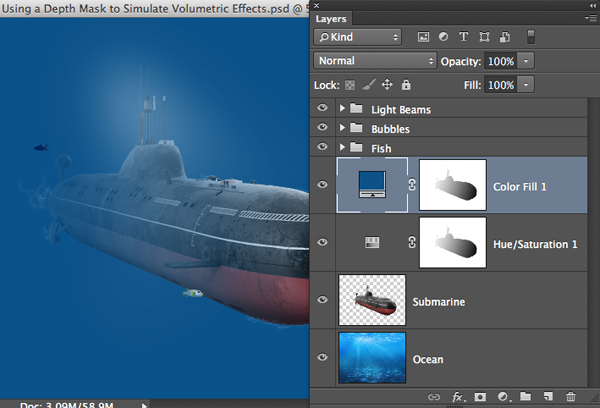 “Simulate volumetric effects”â¦what? Those just sound like a bunch of big, fancy words. In plain English, what exactly is a volumetric effect? Here’s where things get pretty darn cool. A depth mask is a basic grayscale image that allows us to easily simulate the gradual disappearance of a subject over distance as it is obscured by fog, smoke, dust, or water. Note: Although we’ll create our own depth mask in today’s tutorial, it’s worth mentioning that the new PixelSquid website is loaded with 360-degree stock images and every one of them contains a high-quality built-in depth mask. 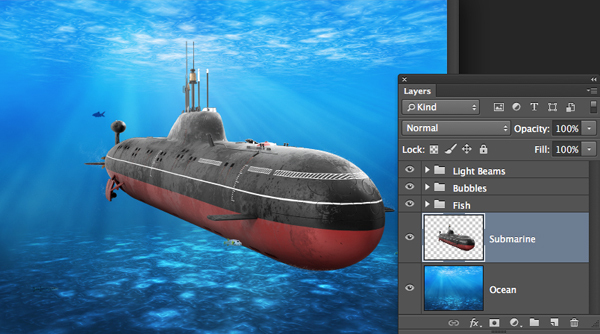 Open a file with a background layer and a subject that’s been extracted and is on its own layer. To appreciate this effect, choose a background that features fog, mist, smoke, dust, or water. 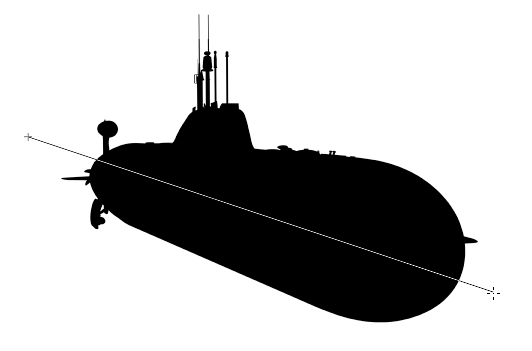 In this submarine example, notice how the sub currently doesn’t look like it’s submersed in water. 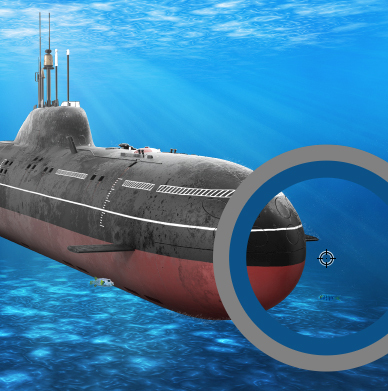 If it were, the more distant parts of the sub would be covered by a larger volume of water and would be more obscured by blue. In addition, since blue water quickly filters out the red wavelength, the red paint would grow gradually less intense over the distance of the sub. 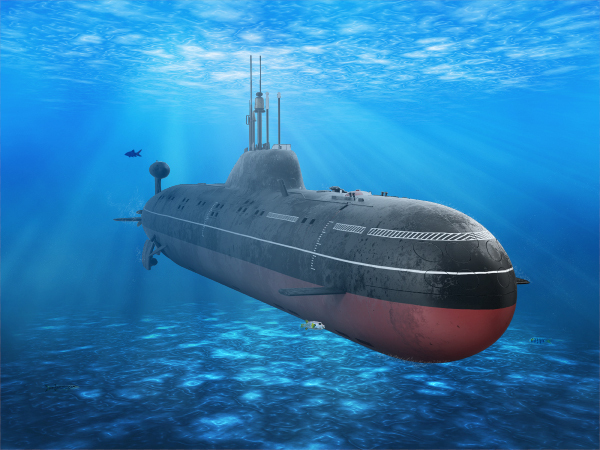 A depth mask will allow us to accomplish these tasks and realistically “submerse” the sub. Before we start, it’s helpful to understand how a depth mask works. A depth mask assigns a grayscale value to each pixel based on its proximity to the camera, so the further away an element, the lighter the pixel, and the closer an element, the darker the pixel. Now that we understand the basic principle of a depth mask, let’s create one. Press Command-I (PC: Control-I) to invert the channel. To create the depth mask, we’ll run a Linear gradient through the sub. Activate the Gradient tool. Press D to set white as the Foreground Color. 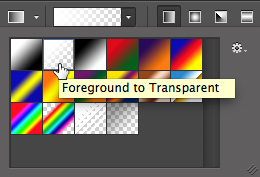 In the Options Bar, open the Gradient picker and choose the Foreground to Transparent option. 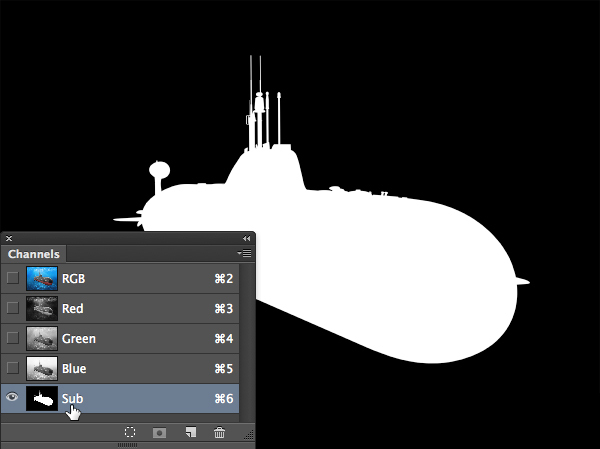 Ensure that the Linear Gradient icon is selected and drag a gradient from just beyond the sub’s stern (rear) to just beyond the bow (front). Now we’ll drain the red color over a distance using the depth mask. 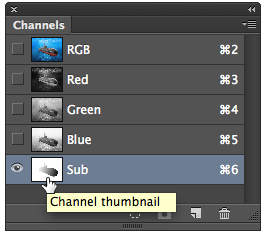 In the Channels panel, Command-click (PC: Control-click) on the Sub thumbnail to load the depth mask as a selection. Still in the Channels panel, click the letters “RGB” to safely exit the Channels panel. If the Adjustments panel is not open, choose Window>Adjustments. Click on the Create a new Hue/Saturation adjustment layer icon. 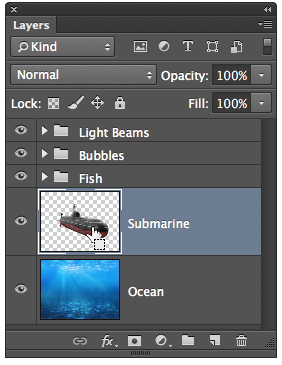 In the Properties panel, select Reds from the pull-down and drag the Saturation slider completely to the left. Because of the depth mask, notice how this drains more color from the distant part of the sub than it does from the close part. Cool! 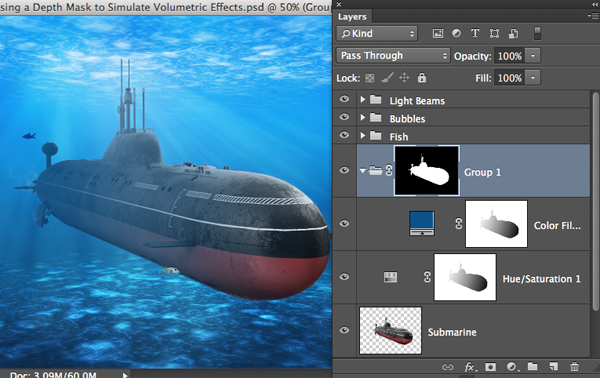 Now let’s gradually obscure the sub over a distance with blue water using the same depth mask. Activate the Hue/Saturation layer thumbnail (not mask) and choose the Eyedropper tool. Click to sample a dark blue color from the ocean.